I take care of the details. I'm available to you and honest with you. Our foundation is to serve our clients with detailed information about their case and where it stands. We give you options and make a decision with you. It's a team effort with our client - attorney relationship. I work to get you the compensation you deserve. Being hurt in an accident can have a devastating impact on your life. We offer personalized, high-quality legal representation to clients throughout Central Ohio to help them get their lives back on track after an injury. Ray has devoted his career to fight for the rights of people who have been injured in accidents. With a proven track record of success, Ray is dedicated to providing each of his clients with personalized service and top-quality legal representation. The legal process can be complicated. We will answer your questions, making sure that you understand your legal rights and what is happening with your case — without legal jargon and doubletalk. What do I do if I am in a Collision? If you’ve been hurt in an accident, you may be unable to work. Between medical treatment and household bills, you may be overwhelmed with financial obligations. We understand how challenging recovering from an accident can be, which is why we do not charge our clients a fee unless we are recover money for them. We work on a contingency fee basis, which means that you pay no money up front to retain us. If we negotiate a settlement or win an award for you, our fee is a percentage of the total recovery. Gone are the days that liability insurance carriers would gladly pay you at least three times your medical expenses. It seemed like an easy way to value claims and claims were settled in a prompt manner, at least the smaller claims. Now, the insurance companies evaluate claims in a much different manner. Some insurance companies use computer programs to evaluate the value of your medical bills, the credibility of your treatment and the estimated value of your pain and suffering. You should call an attorney as soon as you believe you may need some advice. Depending on the nature of your case, the delay of hours or days can result in the loss of evidence, witnesses and may result in adverse actions being taken against you. We truly believe that most legal matters are like playing a game of chess. It is best to get a full understanding of the legal matter as soon as possible, formulate a strategy and then put the strategy in place. Many clients report that they were scared, shaken up, dazed, confused and full of adrenaline following their accidents. These are common responses to being involved in a serious accident. If you're injured get help, file a report with the police, take photographs, get insurance information, and witness information. Many insurance companies want to take statements immediately following an accident and/or they may ask you to sign medical authorizations. An attorney can advise you of your rights and obligations and may be able to assist you in ensuring that you are fully compensated for your injuries and other related damages. At E. Ray Critchett, LLC, we are more than just a law firm — we are advocates who are committed to helping you through the legal process. From the first meeting to the conclusion of the case, we will be here for you. With over 15 million dollars in jury verdicts, arbitration awards and settlements on behalf of our clients, we have the experience to help our clients get the compensation that they deserve. We are skilled at handling personal injury cases throughout Central Ohio — and we have the results to prove it. Beyond legal know-how, we offer personalized service to each and every one of our clients. We focus on quality over quantity and work hard to ensure that our clients understand their rights. With free consultations and flexible schedules, we accommodate our clients’ needs, because we know how difficult it can be to get your life back on track after an accident or injury. We will guide you through the process, providing advice, counsel, and answers while we work to get the best possible result for you. Client was struck by an uninsured motorist and sustained spinal injuries which led to her death. Franklin County. State Farm Insurance. Client sustained a cervical fracture following a motor vehicle collision. Unfortunately, his physician failed to notice a bone fragment which resulted in additional injuries. Delaware County-filed. Client was a passenger in a vehicle when his friend lost control of the car. Two young men died and two others were severely injured. Limited insurance available. State Farm / GEICO. Client was struck by a forklift sustaining a lower leg fracture and developed RSD. Pickaway County-filed. Genesis Insurance. With Thanksgiving just a few days away, it is important that you are made aware of the recent recall that has been issued for raw turkey products. We are proud to represent clients throughout our capital city, including the University District, the Near East Side, Clintonville and Forest Park. We represent clients in personal injury cases throughout Franklin County, including Worthington and the surrounding towns. 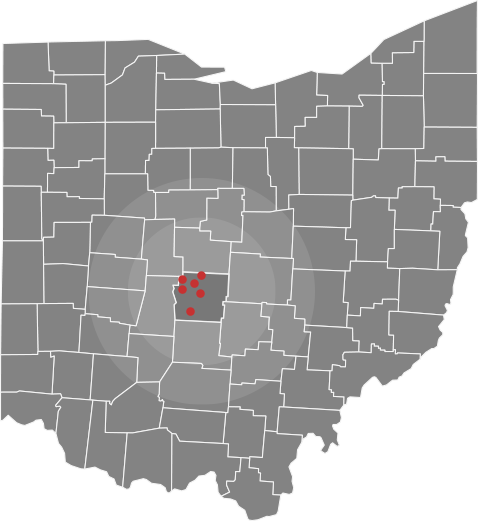 Our firm serves clients in the Westerville metro area, including both Franklin and Delaware counties. With an office in Dublin, we represent clients in Franklin, Delaware and Union counties in personal injury cases. In Grove City and all surrounding areas, we represent clients in cases involving personal injury, negligence, and wrongful death. Our firm represents clients who have been hurt in accidents in Hilliard and all suburbs of Columbus and Franklin County.